Details: 4 BR, 3 BA Beachfront Residence with approx. 1,500 s.f. Misc. 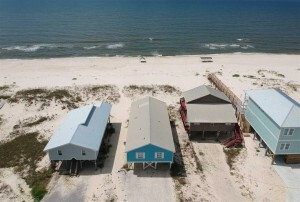 : Gulf Shores Alabama Beach Home for sale in Fort Morgan. This beautiful beach home just off of Fort Morgan Road has it all. With 4 bedrooms and 3 bathrooms, this home has plenty of space for you and your family. The kitchen is fully equipped with stainless steel appliances, granite counter tops, breakfast bar, wet bar and a separate dining area. There is a large glass sliding door in the living room that gives you the perfect view of the beach to watch the incredible evening sunsets. The master bedroom has private access to a covered patio. As you make your way down the patio staircase, you can take a quick walk straight down the beach! Don't miss this property, come see it today!